QUATHIASKI COVE, BC, Apr 6, 2015/ Troy Media/ – Boobies, like albatrosses, can be forgiven for feeding plastic to their chicks because they think it’s just another nourishing bounty from the sea. Turtles make the same mistake, believing floating plastic bags are delicious jellyfish. So the guts of these birds and animals get clogged with our indigestible garbage. Many die of digestive obstruction and starvation. Whether we can be forgiven is quite another matter. We made the plastic, concocting it from petroleum by elaborate alchemic processes that render the stuff almost indestructible. We produce and use millions of tonnes of it per year, then discard it with the same profligacy. It litters our beaches, in some parts of the world piled high like driftwood. In the oceans it collects and floats in country-sized gyres, great abnormal and proliferating ecologies that become toxic platforms for opportune organisms to inhabit. A study led by Jenna Jambeck of the University of Georgia, published in the February 2015 edition of the journal Science, calculated that of the nearly 300 million tonnes of plastic now produced annually by the world’s 192 coastal countries, an estimated 8.8 million tonnes ends up in the world’s oceans. While most of this marine pollution comes from Asian countries – some of their rivers are used as disposal systems so just throw the plastic into the current and it gets flushed away to some unknown destination – England’s Thames also carries worrisome amounts of plastic. Another study estimated that about one billion microplastic pieces reach the Pacific each day from Southern Californian cities. The several monstrous gyres of floating plastic recently identified account for only some of this debris. According to the Jambeck study, about “99 per cent of the ocean’s plastic is missing” – it simply disappears somewhere into the marine ecology. Some of it is known to sink, becoming part of a “plastisphere” inhabited by crabs, shrimps and other creatures. Some of it gets fused with sand and stones to become a new kind of rock called “plastiglomerate”. Some is slowly ground into microparticles by the action of currents, wave and tides, ready to be eaten and incorporated into the food chain. We have made about six billion tonnes of plastic since 1950, with most of it being discarded and added to the environment. To give some sense of the 8.8 million tonnes of almost indestructible plastic contaminant being added to the oceans each year, Jambeck explained that it’s the equivalent of five grocery bags full of plastic debris dotting each foot of shoreline around the world’s coastal countries. The problem was first identified in the 1970s when about 0.1 per cent of plastic production was getting into the oceans; the rate may now be as high as 4.5 per cent. And this doesn’t account for the whereabouts of the rest of the plastic, much of which is not recycled. We are engaged in an irreversible polluting process of such magnitude that it can only be summarized as obscene. The old adage is true that we can never throw anything “away” because there is no “away” to throw it. Earth is a single ecology, and the only one we have. If we poison or despoil it, we don’t have another. And the evidence is that our wayward and lackadaisical relationship with plastic is returning to haunt us. Indeed, “The future is plastic”. But, whereas this prediction was once understood in glowing economic terms, it can now be understood in ominous ecological terms. Almost no beach or ocean on the planet is free of discarded plastic. It can be found as microparticles in the sand on the Maltese Islands of the Mediterranean and the remote Canary Islands of the Atlantic, and on the beaches of the Northern Pacific from Vancouver Island to Haida Gwaii. Studies in the Baltic Sea indicate that zooplankton ingest microplastics, which are then ingested by shrimps, clams, mussels and other larger feeders. The ocean surrounding Australia has measurable quantities of microplastics with a median length of 2.8 mm, broken down from mostly packaging made of polyethylene and polypropylene. Similar concentrations are found in the Caribbean. 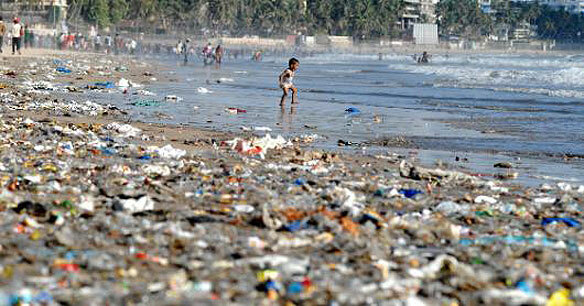 No ocean in the world is exempt from plastic contamination. The ocean and beaches of the Pacific Northwest, for example, contain measurable amounts of polystyrene components: styrene monomer, styrene dimers (2,4-diphenyl-1-butene and 1,3-diphenyl propane), and styrene trimer (2,4,6-triphenyl-1-hexene). In a 2014 study from the University of Victoria on microplastics in seawater along BC’s coast, the researchers found up to 9,180 pieces per cubic metre in some locations – each piece about the size of a coffee ground. Concentrations were usually higher closer to urban centres. The Strait of Georgia, for example, averaged 3,200. Because of tides, currents and weather, the highest average concentration was in Queen Charlotte Sound, with 7,630. The average for all Vancouver Island waters was 2,080 pieces per cubic metre. The study provides photographs of small copepods with pieces of ingested microplastics in their bodies, the first step in the migration of these wastes up the food chain to us. As we dine on seafood and behold the wonders of our plastic future, we can revel in the praise we lavish on our ingenuity, and cringe at the censure we deserve for our foolishness. One Response to "8.8M tonnes of plastic pollute oceans every year"
Ray, lets bring it closer to home. are cleaner than we are. continue. We see pretty pictures, occasional media cover. So? Big deal.